Solution: A pure substance consists of single type of particles that is all the constituent particles of a pure substance have same chemical nature. Homogeneous mixtures have uniform composition. Heterogeneous mixtures have non uniform composition. It has no visible boundaries of separation between its constituents. It has visible boundaries of separation between its constituents. They are heterogeneous in nature. They are homogeneous in nature. They scatter a beam of light and hence show Tyndall effect. They do not scatter a beam of light and hence do not show Tyndall effect. Examples of solution are: salt in water, sugar in water. • Melting of butter in a pan. • Boiling of water to form steam. • Passing of electric current through water, and water breaking down into hydrogen and oxygen gas. • Dissolving common salt in water. • Making a fruit salad with raw fruits. Filtration or Centrifugation or decantation. First, water is taken as a solvent in a saucer pan. This water (solvent) is allowed to boil. During heating, milk and tea leaves are added to the solvent as solutes. They form a solution. Then, the solution is poured through a strainer. The insoluble part of the solution remains on the strainer asresidue. Sugar is added tothe filtrate, which dissolves in the filtrate. The resulting solution is the required tea. 7. 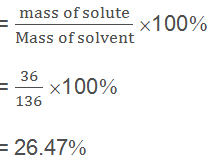 Which of the following materials fall in the category of a "pure substance"? 9. Which of the following will show the "Tyndall effect"?